Elevated platforms carry RandstadtRail and HTM tram services on the Den Haag Centraal concourse. Netkoos viaduct carries RandstadRail lines 3 and 4 through Den Haag’s business district. Map of the RandstadRail system. RandstadRail Den Haag-Zoetermeer public services were reinstated in autumn 2007. Track sharing: RandstadRail Line 3 service to Loosduinen terminus ahead of an HTM tram in central Den Haag. The former Hofpleinlijn now has RandstadRail Erasmuslijn branding in advance of incorporation with Rotterdam Metro's line of that name. On RandstadRail lines 3 and 4, Beatrixkwartier station is built into the Netkoos viaduct. Completed in 2008, the Boortunnel connects RandstadRail with Rotterdam metro. With low and high-floor vehicles in use, the shared section of Randstadrail has stations with twin-height platforms, as here at Laan van NOI. The Randstad is the name given to the densely populated western rim of the Netherlands, a conurbation that accommodates around two-thirds of the Dutch population. RandstadRail emerged from a long-envisaged scheme to connect the transport system of the country’s second city, Rotterdam, with that of Den Haag (The Hague), the seat of national government. This major project was to involve building new routes and taking over under-used former heavy rail lines, to develop a system which served the commuter population of surrounding satellite towns. However, the large number of authorities and interest groups meant that decision making was protracted, similarly with the limited compatibility of the infrastructure to be assimilated under the RandstadRail banner. "For Den Haag-Zoetermeer services, HTM placed a €150m order with Alstom to supply 50 Regio Citadis three-car low-floor tram-trains." Two NS (Nederlandse Spoorwegen – national rail operator) heavy rail lines were taken over for redevelopment as the principal RandstadRail routes. One connected the expanding new town of Zoetermeer with Den Haag, lightly used due to service frequency and inconvenient access for more recently developed areas. Zoetermeer itself also gained a new light rail line that encompassed more residential areas, creating a total 36km (22.5 mile) for the northern part of Randstadrail. The other route, the 32km (20 mile) Hofpleinlijn linked Den Haag and Rotterdam, joined by the Zoetermeer line for the entry into Den Haag. Through modernisation and increased frequency, the objective is to greatly increase passenger numbers over levels experienced by the lines in pre-RandstadRail days, four-fold for Zoetermeer and double for Den Haag-Rotterdam. Both routes have been equipped with a 750V dc overhead supply, although RandstadRail services also use 600V dc tram lines within Den Haag, so new vehicles are dual voltage. As with the nearby RijnGouweLijn light rail project, RandstadRail development has not been smooth, and more serious problems emerged with the start of passenger operations. Derailments on new infrastructure of Regio Citadis and HTM trams, some leading to injuries, in late 2006 attracted widespread coverage and criticism. Rover, a pressure group for the rights of Dutch public transport passengers, threatened legal action and called for the infrastructure to be transferred to national heavy rail operator ProRail. Den Haag has undergone highly visible changes to accommodate RandstadRail and the city’s extensive tram service, notably at Centraal Station where a viaduct adjoining the bus interchange carries light rail tracks across the main terminus concourse. Linking directly with commercial properties and car parks, the Souterrain tram tunnel completed in 2004 takes R3, R4 and tram services south-west under the city centre. In the opposite direction, the Netkous (net stocking) space-frame tubular viaduct through the business district includes the station at Beatrixlaan. 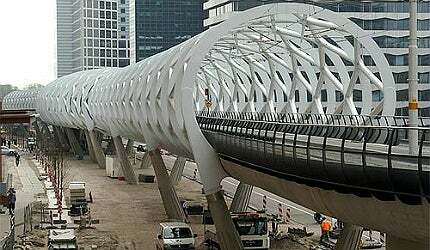 Designed by Zwarts and Jansma, it provides a vital link in the system by taking lines onto the new high level at Centraal and a junction with tram routes at Ternoot. A Den Haag CS-Rotterdam Hofplein Randstadrail service began in 2006 with re-branded RET (Rotterdamse Elektrische Tram) metro stock. Passengers have better interchange options with other transport modes in Rotterdam from 2008 with the completion of the 2.4 km (1.5 mile) twin-bore Statenweg tunnel linking the Hofpleinlijn and the metro at Rotterdam Centraal. The current metro station was modernised in December 2011 and gained a third platform to accommodate the service extension. To cope with the different types of rolling stock that are used on the RandstadRail, some stations are built with platforms to serve both low-floor and high-floor levels of entry. Two sizeable orders for new rolling stock were placed with two of the world’s manufacturing giants, Bombardier and Alstom. Although with common branding, the two main elements of RandstadRail feature different stock, sharing only a small proportion of the system’s length. "Two NS (Nederlandse Spoorwegen – national rail operator) heavy rail lines were taken over for redevelopment as the principal RandstadRail routes." RET’s €83m Bombardier order is for 21 Flexity Swifts for use on the Rotterdam-Den Haag line. For Den Haag-Zoetermeer services, HTM placed a €150m order with Alstom to supply 50 Regio Citadis three-car low-floor tram-trains. The air-conditioned vehicles have cabs at each end, capacity for up to 220 passengers, five doors each side and a passenger information system. As with the Flexity Swifts, they have a maximum speed of 80km/h (50mph). Within their own type, two units can be coupled for peak demand. Multipurpose areas in all vehicles help service the high level of cycle usage in the area. To avoid delays, several road intersections that cross the RandstadRail line have been closed to all traffic. A central traffic control centre oversees the operation of the entire system. Displays at all stops alert drivers as to the exact time trams should depart. All trams stop at all stations and have uniform waiting times. Following investigations and test operations in the wake of the operational problems during the previous year, services on RandstadRail Lines 3 and 4 were restored in stages in September-October 2007. The Boortunnel was completed in February 2008. Through services to Slinge metro station in southern Rotterdam, which features a park and ride site, started in December 2011. The success of the concept may determine whether RandstadRail branding will expand or remain to serve only the south-west part of the Randstad area.